It might take you a second to see the connection between the mural on the side of the Chew Chew's Diner and the Cabbagetown restaurant's name. But hold your groans... Chew Chew's knows their train fare just as well as their diner fare (yeah, I went there). The restaurant serves up a variety of poutines, hot sandwiches, rotisserie chicken dishes, steaks, and burgers with cute titles like The Big Track Burger ($8.95) and the Little Caboose burger for kids ($5.95). As with all great greasy spoons, however, the main attraction is breakfast. 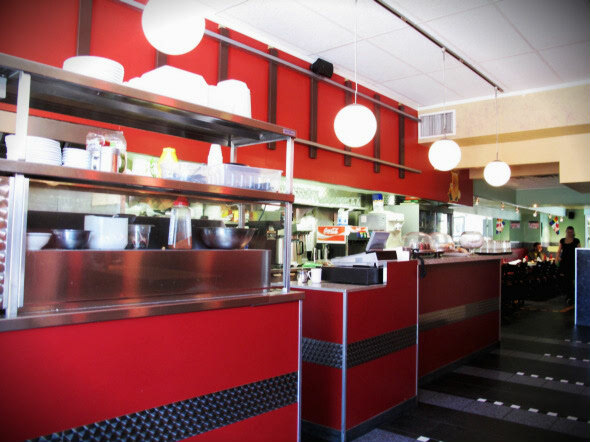 Breakfast alone takes up half the menu, and Chew Chew's will have you chew-chewing over your options for a good while. 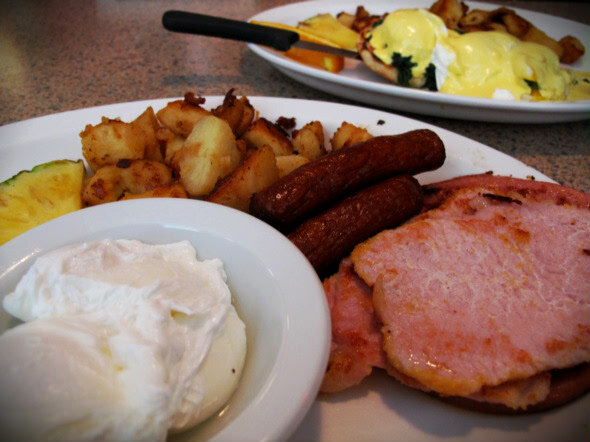 We slid into our booth and after some humming and hawing, we settled on the All Aboard Special with eggs, peameal bacon, sausages, and ham; the Eggs Florentine; the Eggs Benedict ($8.95 each); and the Conductors Special with eggs, bacon, sausages, ham, and pancakes ($9.95). Our friendly waitress also gave us a choice between white or brown toast, as well as medium or lightly poached eggs. 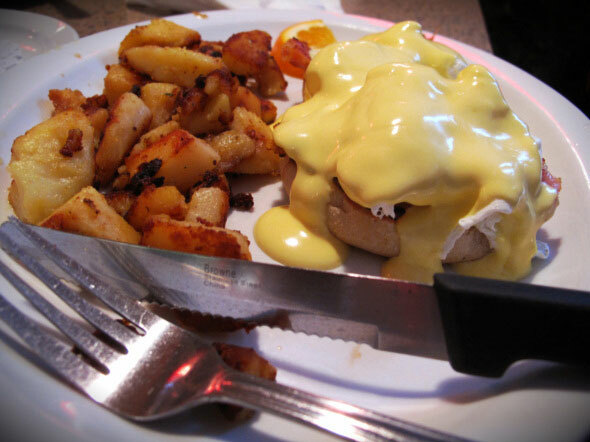 As soon as our sizable plates arrived and our forks went into our mouths, one thing became clear: these folks knew their Hollandaise sauce . My immediate reaction upon tasting was something like, "Wow, they must have melted a whole stick of butter on this." All of our meals came with a small slice each of orange and pineapple. The home fries were nothing out of the ordinary and could have used some spicing up, but with eggs this good, we weren't complaining. The free coffee with any breakfast (Monday to Friday before 11am) was a welcome addition, but I decided to splurge on the hot chocolate with whipped cream ($2.25). A bit pricey for what I got, but it hit the spot. As we talked and ate, our attention was drawn to something we hadn't yet noticed about the rotisserie oven situated prominently by the front window - a bright red choo-choo train smokestack poked out the top of the steaming metal box. A cute touch, we thought. Then we noticed the train tracks on the wall behind the front counter, and the striped cotton conductor's hats the staff wore. It seemed as if we were noticing a new railway-themed detail with every passing minute. And it certainly had the desired effect - the more time we spent in the narrow restaurant, the more we felt like we were... well, on a train. 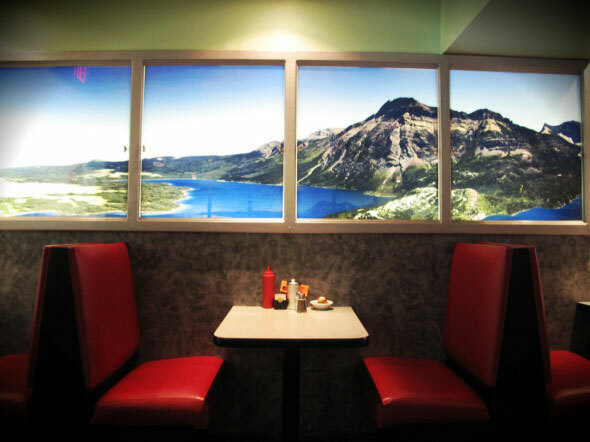 We wandered towards the back of the diner and were pleasantly surprised by the pictures lining the walls, made to look like we were looking through train car windows at the idyllic scenery passing by. I was slightly disappointed that we hadn't managed to nab ourselves such first-class seating coming in. At the back of the restaurant we came across several famous black and white railway-themed photos on the walls. One was an anonymous photo of New York's Grand Central Terminal on a sunny morning in 1934, and one was an O. Winston Link photo of Virginia's Luray Crossing in 1955. My favourite by far was the photo of the 1895 Gare Montparnasse derailment in Paris.